What's next for law firm leaders? MimesisLaw: "Senior Privilege: How Some Law Firms Stifle Rainmaker Development"
I met with Lee Pacchia on Mimesis Law's "Business of Law" web TV program to discuss, among other topics, my recent post in which I described how some law firms are stifling the growth of future rainmakers. I made a few bold comments, many of which are culled from the remarks and presentations I deliver at numerous law firm and law department retreats, and from previous articles. Yes, it's easy to lob critiques. But it's also easy to hide from the truth. There are answers for the major challenges facing law firm leaders, yet we see so few bold, progressive moves on any scale. 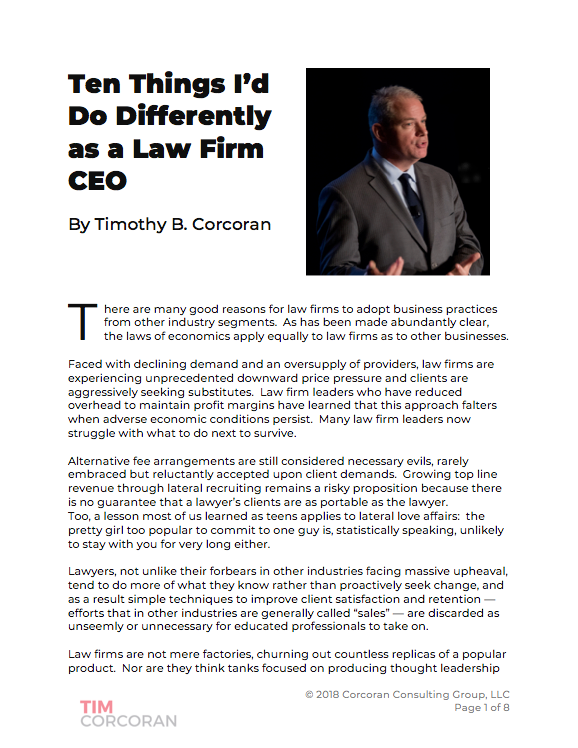 "Law firm leaders tend to think their business is so complex and challenging and unlike others." Nonsense. Most complexities are self-induced. Many leaders are challenged by the changing incentives driven by client price pressure. Finding the right balance between rewarding the origination of new matters, which is important in all industries and should be rewarded well, and those who deliver the work, maintain the relationship, upsell or cross-sell additional services, or focus on client retention, can be challenging, but there are hundreds of compensation schemes used every day in every business that can provide guidance. Law firm leaders who invent their own plans to address their "unique" business model are often simply unaware of these other models. "I've come around to the view that you can't change behavior unless you change the compensation plan first." Many partners won't say it out loud, but I will: if it looks like changing behavior is contrary to a partner's financial self-interest, it's easy to find numerous objections that pertain to quality, or client satisfaction, or the infinite variability of legal matters. Fact is, it's not a choice between making more money and making less money. If we have to change the compensation plans to emphasize different outcomes such as, say, profitability, client retention, and client satisfaction, and de-emphasize the longtime inefficient proxy for all of this, namely hours, then so be it. Good lawyers will continue to make good money. "If you're hiring the wrong people and you can't trust them to write an article that puts the firm in a positive light, then I'd look in the mirror and say who am I hiring and what are my skills as a manager?" If you can't trust the people you hire, then fire yourself as a manager, since you're evidently terrible at recruiting, on-boarding, and training. "The younger generation is not bound by the traditional partnership path." It's a cop out to say that the younger generation of lawyers doesn't want to work hard just because many tend to eschew the traditional pursuit of Biglaw partnership. For one, they're aware of the math that illustrates the extraordinary unlikelihood that the firm hiring them out of law school will anoint them partner someday, regardless of how hard they work. They're also adaptable and flexible and value their time differently. Embrace their creativity and use this flexible work force as a competitive advantage. "It's easy to demonstrate that changing behaviors will put more money in the partners' pockets." Many partners embrace the fallacy of the false dilemma when they assume they must either pocket profits or reinvest in the firm for future growth, i.e., deplete the profits and thereby lower their compensation. By maximizing short-term profits, they have always forgone more lucrative long-term profits. They're like day traders flipping a stock purchased in the morning for $32.05 and selling it in the afternoon for $33.50, yet ignoring the better option of holding onto the stock for 6 months until it reaches $176. Of course it's a bit more complex than this... but not much. "A law firm partnership model is a ridiculous model for governance. Giving people an equal vote on how an operation should run is silly." This is not even worthy of a lengthy debate, as it's been long-settled in every other business on the planet. Corporate stakeholders include clients, competitors, employees, bond holders, equity investors, management, executive leadership, and board members, and yet very few of these stakeholders have a voice in the daily operations of the enterprise. Allowing every partner a say in operations just because he or she has an equity stake is as sensible and noisy and ill-informed as conducting a political debate on Facebook and expecting a rational dialogue. "Nowhere in my job description does it say I've got to protect the model of the Biglaw business." Dominant incumbents in any market will erect any roadblock to change under the guise of quality, competitiveness, and customer needs, but in reality most of these roadblocks are designed to protect the status quo. It's human nature. Whether it's auto dealers in New Jersey claiming that direct-to-customer sales are bad for customers, or bar associations prohibiting alternative business structures, the actual voice of the customer is often quite muted in the debate. "A potted plant can demand discounts from suppliers." The notion of continuous improvement in a business is not just about perpetually lowering costs, though that's a key outcome. It's about improving quality and throughput and competitiveness while lowering the marginal costs of production. After several years of essentially demanding discounts from law firms, many GCs have to get more creative. And many are struggling. This speaks to the increased role of procurement (which is as much about analytics as it is about cost). There has never been a more opportune time for law firms and law departments to collaborate to find a better way.